You have questions...We have answers! In an effort to answer many of the questions that clents and prospective clients have about - landscapes, hardscapes, designs, outdoor kitchens, fireplaces, pools and anything outdoors - we started this Blog. We post blog entries on hot landscape topics and answer posted reader coments. It is also a great way for prospective clients to get to know us, how we think and what we are all about. Outdoor Fireplaces - Great way to Warm up on a Cool Fall Night! There is nothing like sitting under the starry skies with the warmth of a fire on a cool fall night. 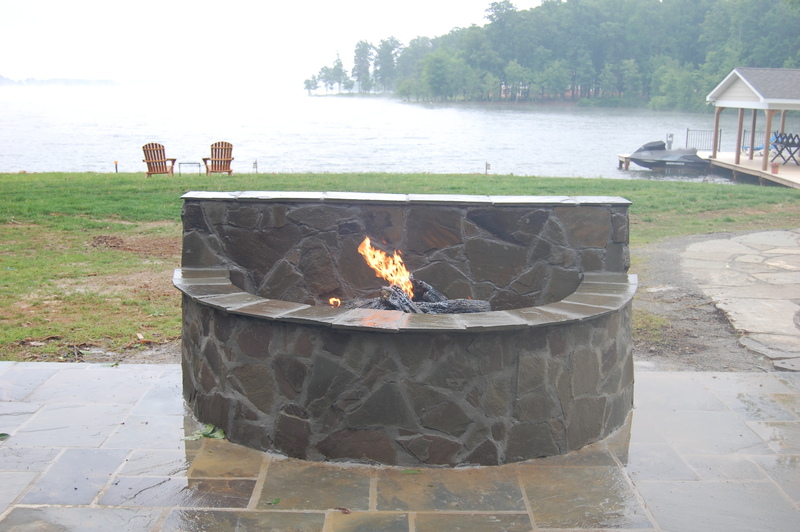 Outdoor fireplaces provide a great atmosphere for a romantic evening or for entertaining family and friends. They also help extend the season or time you can enjoy and fully use your outdoor entertaining area. If you are thinking about putting in an outdoor fireplace and don’t know where to begin, here are a few helpful suggestions to consider when creating your ideal gathering place. Design - As I always say, start with a design. Define how you will use the space: take advantage of a hilltop or water view, create a unique gathering place for friends and family, or build the fireplace into a larger outdoor living room. Research Fire Codes - Each municipality will have fire codes dictating any burning and open flame restrictions and will notify you of any permits needed to build the outdoor fireplace. Ensure the fireplace is a safe distance from your home. Also, check with your homeowners association for any of their guidelines and needed approvals. Choose Materials - There are many materials you can choose from: brick and mortar, stone, cultured stone, slate or stucco. You can either blend your fireplace in with your other landscape elements or create a focal point in your landscape by using different materials. Gas or Wood - Possibly the biggest decision is whether to put in a natural gas line or to burn wood. Decide this upfront, as putting in a gas line after the fireplace is built is more difficult and much more costly. Seating - Always remember that on a cool night a fireplace will draw a crowd, so plan for maximum seating! Look for ways to incorporate seating into the design with a fireplace hearth or seat wall. Decorating - Bring your own personal style to the fireplace. Include a mantel to create a unique style or use it decorate with artwork made from outdoor elements. Whatever you decide to do with your fireplace, start with a plan so that your outdoor fireplace serves your needs and fits your style. For more pictures and information on outdoor fireplaces, visit our Outdoor Rooms page at Carville Landscape Co.